At its recent Team GNE Awards, the region’s largest bus operator recognised those who are helping to bring the company’s vision, beliefs and attitudes to life. With an inclusive peer-to-peer nomination process, team members were empowered to get involved. Categories on the bill recognised talent throughout the business, with top-end prizes up for grabs for winners - including European mini-cruises with DFDS, luxury hotel and spa breaks and delicious dining experiences. Individual awards included Apprentice of the Year, Engineer of the Year, Driver of the Year, Charity Star, Excellence in Customer Service, Team GNE Star and the Leadership Award, which was claimed by Shirley Connell, divisional manager - North region. Based at the flagship Riverside depot, Shirley was commended as an important senior management team member and was recognised for her unwavering commitment and dedicated in helping the company meet its operational and commercial objectives. 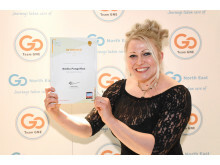 Also scooping an award was Poland-native Emilia Fengriffen – taking home the title of Team GNE Star. Other inspiring female shortlists at the Team GNE Awards included Zoe Gibbons from the customer services team and Lyndsey Fenwick a driver based at Gateshead Riverside.